For years I’ve been living with a common parental illness known as Mom-zheimer's. Parents with this affliction forget, sometimes immediately, what things were really like. Constantly saying to yourself “This is going to be fun!” followed by “What was I thinking? 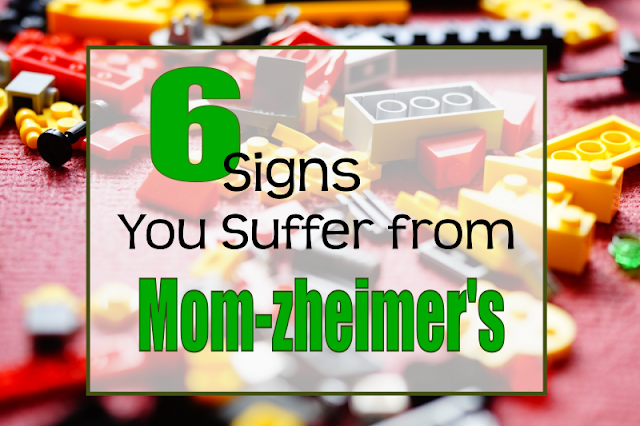 !” is the most common symptom of Mom-zheimer’s. 1. You take your kids to the playground. When we visit the park, my plan is usually to let the kids run wild while I read a novel or maybe chat with the other moms. But actually, the kids think it’s more fun to sit at my side begging for snacks and complaining that they’re hot and/or thirsty. Things look promising once they start playing, but it’s just an illusion. Forget small talk, I’m too busy responding to cries of “Push me! Catch me!” And every time I try to crack open my novel someone asks, “Um, is that your toddler throwing mulch at everyone? Again?” No wonder I’ve been reading the same book since 2013. Click here to read the rest over at What's Up Fagans, where I'm guest posting today*! *And by today, I mean back in August when I wrote this post and completely forgot to tell you about it. I know you guys think I'm a totally professional blogger who never does stuff like that, but... just kidding. I hope none of you really think that. The park. I've learned to hate the park. I can't even get through a sentence before having to tell someone that rocks are not things we throw or to take turns. Plus our closest park is tiny so they get tired fast. The best park times are when we take a lunch to a bigger park with lots of cousins. Still some yelling but not nearly as much nagging to be pushed on the swing or tattle telling. Oh man, even though my daughter knows how to swing herself, she still asks me to push her. I'm like, "Lady, you're nine. I'm reading." And then the other moms will give me a LOOK like "Be happy she wants you near her," and I want to say, "I KNOW, but I just want to READ!" Love your post and hope you're doing well my friend!!! Heading over there now to finish reading! Yep, the park is never a relaxing little jaunt is it? Someone on the blog's FB page just pointed out to me how ironic it is that I forgot to post this... like I have Mom-zheimer's or something! As long as I don't come up with the bright idea to bake something with a kitchen full of kids (#3 on the list), we're doing great! They're fine if you acknowledge beforehand that it's not going to be a relaxing sit-on-the-bench-and-read-a-book kind of thing. As long as you realize you're in for an hour plus of getting up and down and pushing swings and watching them go down slides and rescuing them from the monkey bars, I think you'll be fine.